We focus exclusively on personal bankruptcy work in chapter 13 and chapter 7 cases. Our friendly, professional staff and attorneys have the knowledge and experience to answer your questions and to help you avoid any potential pitfalls in the bankruptcy process. Smart choices today can help you realize the future you deserve. 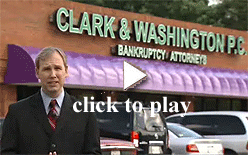 Trust the bankruptcy experts at Clark & Washington to help relieve the financial burdens that are overwhelming your life"